On Monday, August 18th a print exhibition "Encumbrance" by Katherine Rhodes Fields was open. 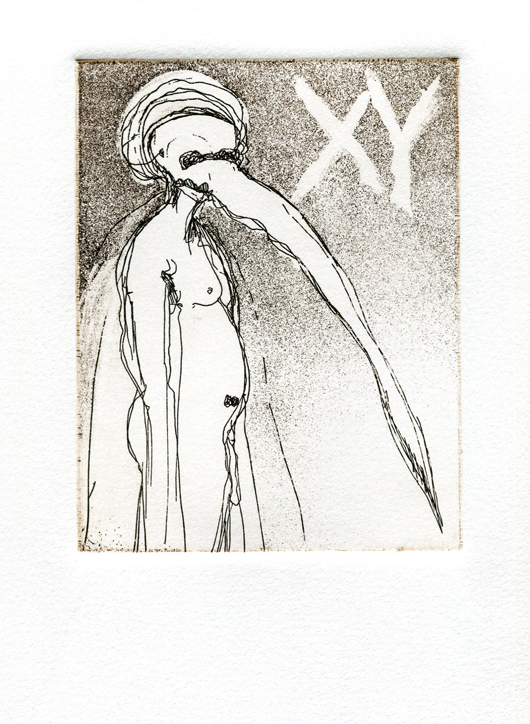 In Encumbrance, a series of zinc-plate etchings that are the latest in a larger and evolving corpus, printmaker Katherine Rhodes Fields probes issues of identity, self-awareness, and the tension between the individual and society. Like the tronie (literally, “face”) paintings of the Dutch Golden Age, in which the individualized features of a sitter are depicted in exaggerated expressions of emotion and/or attired in the accouterments of an historical figure or stock character, each of Fields’ etchings presents a solitary figure in a three-quarter view, or full face with torso in profile, or vice versa; and in the trappings of a persona. Distinctively unlike their Netherlandish predecessors, the face of each of Fields’ subjects is concealed behind the prophylactic mask of medieval plague doctors. In her reinterpretation, the individualization of the tronie has been internalized, and differentiation is visible only in costume or anatomy. The mask, a motif that unifies the series, pronounces each specimen an anti-portrait. The evocative imagery of Encumbrance juxtaposes figurative elegance with the grotesque. Sketchy line work, almost Mannerist in its sinuosity, softens contours and elongates forms. A richness of textures in the aquatint, at times pointillist or stippled in effect, at other times as layered as watercolor, opens an atmospheric depth from which the subjects emerge like phantasmagoria, each isolated within its own visual miasma. The plague doctor’s mask, so avian in appearance, and stylized to gangling proportions, renders each of its wearers simultaneously as vulnerable as a chick and as menacing as a raptor. The semiotics of the mask is multifaceted. In its most basic form and function, the plague doctor’s mask, with its outstretched beak full of aromatic substances to avert contagion, is — like the helmets of warriors and athletes — defensive (although, in hindsight, futilely so). Moreover, a variety of aspects from a wide range of performance traditions are manifested in Fields’ masks. As in Noh drama, the plague doctor’s mask signals a predetermined role. In Encumbrance, that role is the subject of a portrait who is immediately recognizable as such, yet ultimately unknowable. Like the celebrants of West African masquerade dances who are transformed by the masks they don, the selves of Field’s sitters are subordinated behind the plague doctor’s mask. Similar to the masks of satirical Commedia dell’Arte that disguised the identities of actors whose insults and criticisms frequently challenged powerful interests, Fields’ masks hide her sitters from scrutiny. It is this ambiguity of masks—protection, symbolism, transformation, or disguise— from which Fields considers the struggle of identity. This conflict is perhaps best expressed in the Japanese concept of honne (the individual’s true feelings) and tatemae (the public behavior expected by society), and the tension between the two. Encumbrance raises similar conceptual dichotomies in our enactment of self— personality versus persona, nature versus nurture, independence versus interdependence—in posing the question: If self is actualized through performance, how much is inherent and how much is conditioned? 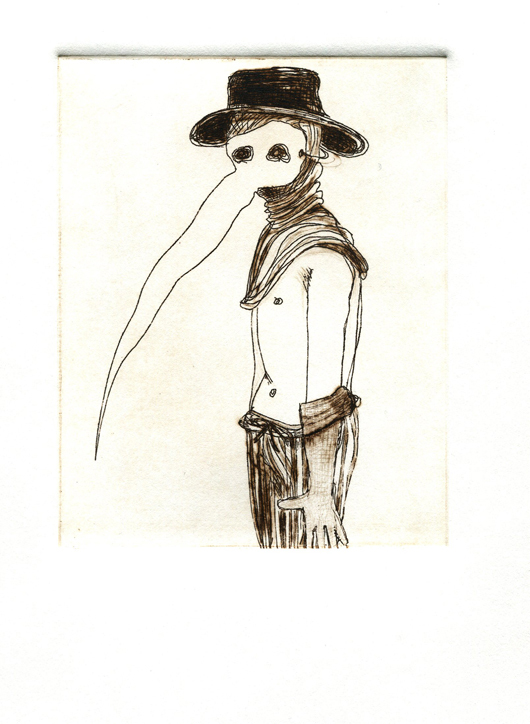 Fields’ plague doctor mask, which depersonalizes each sitter and reanimates the wearer as something between human and marionette, begs: Who, or what, is the unseen puppeteer? M.
Fields accepted the position as Professor of Art at Houston Community College, Central Campus in the summer of 2012 and currently heads the Printmaking Division at HCC as well as teaches Intermediate and Advanced Printmaking at The University of Houston, Clear Lake in Houston, Texas. She currently lives and works in Houston, Texas. Her handmade books with prints are featured in two publications, 500 Handmade Books: Inspiring Interpretations of a Timeless Form and The Lark Studio Series: Handmade Books. Her work can be found in numerous permanent collections.